Buying gold with 100 gram Degussa Gold Bars is a cost effective and easily exchangeable means to own physical gold. This premium gold ingot is guaranteed to contain a minimum of 100 grams or 3.21507 troy ounces of .9999 fine gold and includes an assay certificate to confirm its authenticity. As one of the most liquid sized of gold bullion bars, Degussa branded gold ingots are traded globally in the precious metals market. Each 100 gram gold bar is issued with the classic Degussa “Sun and Moon” diamond stamp, which carries historical significance as the ancient alchemical symbols for gold and silver respectively. You can store your cast Degussa 100 gram Gold Bars safely and securely with Kitco Allocated Storage. Kitco offers various global options for gold bullion storage that is fully segregated, insured and allocated. Kitco Metals’ network of top-tier gold vaults include some of the most secure gold storage facilities located in Canada, Hong Kong or the United States (COMEX approved). Cayman Islands gold storage is also available (certain conditions apply). Find out more about keeping your gold bar and physical precious metal purchases secure, with our Global Precious Metals Storage Solutions. Degussa Goldhandel GmbH is an established precious metals company headquartered in Frankfurt. Although the Degussa trademark was only registered in 1980, its roots go as far back as 1843 as a gold and silver separation factory established by Friedrich Ernst Roessler. In 1873, several banks and the Roessler family incorporated Deutsche Gold- und Silber-Scheideanstalt vormals Roessler in order to secure its operations to refine large amounts gold for the newly establish German empire. Today, as a continuation of its commitment to the traditional trade of precious metals, Degussa offers a range of gold bars and other precious metal bullion products manufactured to the highest standards by LBMA recognized refiners Argor-Heraeus SA and Valcambi SA through various retail outlets around the world. Why buy Degussa 100 Gram Gold Bars from Kitco? 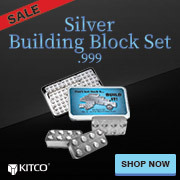 Kitco is a highly trusted leader in the gold bar and physical precious metal bullion industry. Gold bars and other precious metals sold by Kitco are recognized in bullion markets around the world. With our core focus on gold bullion bars, you can benefit from our low gold price and gold bullion premiums that are highly competitive throughout the gold bullion industry. At Kitco, we make managing your tangible wealth safe and easy. You can sell or buy gold bars and other precious metals using our convenient online store, or by contacting our team of highly trained precious metals specialists. Backed by our global information network, Kitco has proudly served our customers since 1977.